The Honoree of the Essence Women in music is Lianne yeah! last year I predicted that this young lady would be big and she is definitely on her way. Her outfit is too fly, Congrats. 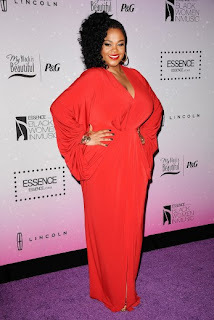 Jill Scott came out to celebrate with Lianne for her Essence recognition, that's what up, Not sure if I'm feeling her outfit, just to much fabric. Solange was also at the Essence event in West Hollywood, her outfit is also on point, I think this short set look is poppin right now. Kelis was out as well on the purple carpet, the verdict it out on her outfit, what do you all think?